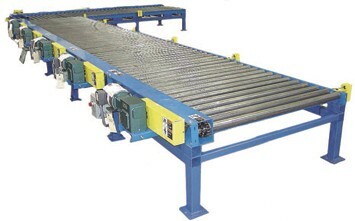 Our heavy-duty chain driven live roller conveyor is ideal for applications where pallets need to be conveyed in a controlled or zoned environment. Each roller has two sprockets that are driven by an adjacent roller. Rollers are held in place between two heavy-duty structural frames, either by internal springs or retaining pins. This conveyor is available in a variety of lengths, widths, and motor sizes. Frames: Structural Steel Channel; 6 @ 8.2 lbs. ; 4 @ 5.4 lbs.